Your Mission Trails Adventure Begins Here! 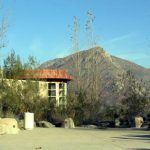 Nestled in the chaparral and sage scrub of Mission Trails Regional Park is the Visitor and Interpretive Center. Each day you'll find people embarking on hikes or cooling down after mountain bike rides. Explore and learn about the wonders of nature and the people who once lived on this land. From Interstate 8 - Take Interstate 8 to the Mission Gorge Road/Fairmount Avenue exit. Turn north onto Mission Gorge Road and proceed for 4.2 miles. When you pass the Jackson Drive intersection, move into the left lane. Look for the large wooden Mission Trails Regional Park sign on the left side of the road, and turn left onto Father Junipero Serra Trail. The entrance to the Visitor Center parking lot is on the left, just before the pipe gate, off Father Junipero Serra Trail. From Highway 52 - Take Highway 52 to the Mast Blvd. exit. Driving from the west, turn left onto Mast Blvd, go under the freeway to the first traffic signal at West Hills Parkway, and turn right. Driving from the east, exit Mast Blvd. and turn right. Turn right at the first traffic signal onto West Hills Parkway and right onto Mission Gorge Road. Proceed south on Mission Gorge Road for 2.4 miles. Look for the large wooden Mission Trails Regional Park sign on the right side of the road, and turn right onto Father Junipero Serra Trail. The entrance to the Visitor Center parking lot is on the left, just before the pipe gate, off Father Junipero Serra Trail. From Highway 125 - Take 125 north to Mission Gorge Road and turn left. Proceed west on Mission Gorge Road for 3.7 miles, staying left at the merge past the east Father Junipero Serra Trail entrance. After you pass the light at Golfcrest Drive, look for the large wooden Mission Trails Regional Park sign on the right side of the road, and turn right onto Father Junipero Serra Trail. The entrance to the Visitor Center parking lot is on the left, just before the pipe gate, off Father Junipero Serra Trail. 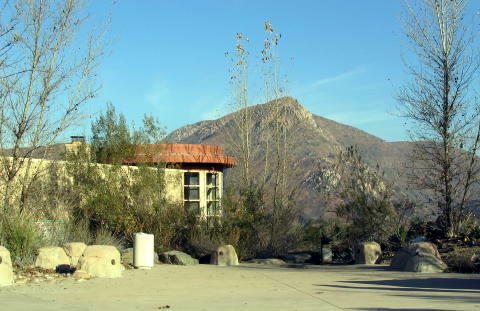 From Route 15 - Take 15 to the Friars Road exit and proceed east on Friars Road, which changes into Mission Gorge Road, for approximately 4.2 miles. After you pass the light at Jackson Drive, turn left onto Father Junipero Serra Trail. The entrance to the Visitor Center parking lot is on the left, just before the pipe gate, off Father Junipero Serra Trail.